Multiple causes aggravate monster traffic jam. Jiang Xueqing and Cao Li in Beijing and Cheng Yingqi in Zhangjiakou report. Lu Yong looked through his windscreen toward the snake of unmoving traffic disappearing into the horizon and swore. "I knew it," he said as he brought his truck to a stop. It was the second time the driver had been caught in a giant traffic jam on the Beijing-Tibet Expressway in the past month. "At least I'm not carrying fruit this time," said the 37-year-old, who was ferrying heavy machinery from Baotou in the Inner Mongolia autonomous region to Beijing. Lu is just one of thousands of drivers caught up in the worst road congestion in recent decades, with many blaming a combination of high demand, limited capacity and ongoing construction work. However, experts speaking to China Daily insisted the country's inadequate freight rail services have also exacerbated the problem. 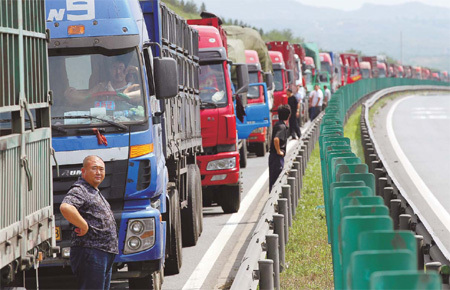 Trains offer much larger volumes than heavy-duty trucks, yet most of the vehicles trapped in the congestion, which began with the first jam on Aug 14 and then a second on Aug 27, were carrying coal from Inner Mongolia to the capital. Official data shows that less than 40 percent of the coal produced in Inner Mongolia is shipped by rail, which is largely due to a shortfall in capacity. Railway services transported 2.1 billion tons of goods during the first seven months of 2010, a growth of 13 percent year-on-year. However, it is still not enough to meet demand, with China's total coal output alone reaching more than 3 billion tons last year. "While the country has witnessed double-digit economic growth since the opening policy, its railways grew only about 1 percent between 1978 and 2004," said Liang Chenggu, a publicity official at the Ministry of Railways. Although there are major plans to expand the nation's network, which already stretches to 86,000 kilometers, most of the work involves high-speed rail links, according to ministry figures. "High-speed tracks can only be used for passenger services," explained Zhao Jian, a professor with Beijing Jiaotong University's school of economics and management. "The extra cargo capacity only comes when (existing) resources become redundant due to upgraded passenger services." Some freight services are even halted for spring rush - the 40-day peak travel period during the Chinese New Year holidays - to allow for more passenger trains to run. "(Resources such as) coal should be transported by rail rather than trucks but the capacity for cargo on the country's railways is just too low," added Guo Xiaobei, director of the National Development and Reform Commission (NDRC)'s institute of comprehensive transportation.